"I would cut off your head, dwarf, if it stood but a little higher from the ground." How do Hobbits sleep? Very comfortably! If you’ve opted for this cozy look, start with the walls. 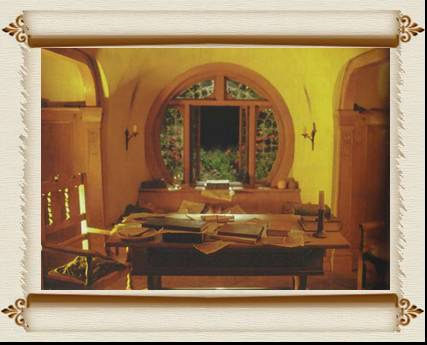 Rag-rolling a deep ocher-yellow over a cream base gives a wonderfully Bag End appearance. You’ll find plenty of articles on this technique by clicking here. Compliment with earth colors of green and brown, and lots of wood. Windows and even doors can be rounded with corrugated cardboard or styrofoam cut to shape and painted to resemble wood. If you have access to plywood and the proper saw, so much the better. Lovely scrollwork designs can be painted in black. Cover windows with shutters cut to fit. Old-fashioned iron beds are wonderful–they often have scrollwork or other fancy decoration which goes beautifully with Hobbit style. A headboard can be fashioned in many ways–more cardboard, styrofoam or plywood for example, and painted to complement the windows. Even a tapestry or large poster hung behind the bed can serve quite well. Modern furniture can be disguised by painting (be sure to remove varnish first). Finish the bed with spread or comforter, rounded throw pillows, and dust ruffle, if desired, of green, brown, or cream, in either solids or tiny prints. Use a splash of red somewhere in the room – a chair cushion, for example, or a small rug or dresser scarf. If you have a wood floor, lay a large area rug with a cozy design on it. If you have wall-to-wall carpeting to deal with, as many modern homes do, do not despair. A room-size rug will cover most of it. 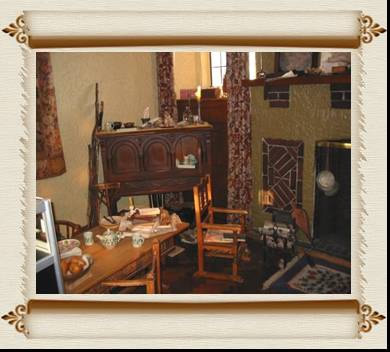 Candles in sconces and wood or brass candlesticks; a walking stick in a corner; a striking piece of pottery; round frames, clocks, and mirrors; piles of old-looking books; yellowed parchment maps; an old-fashioned ink bottle and plume on a wood desk; a rounded basket with lid to use as a hamper; wood pegs with muslin clothes and old caps hanging on it; a wood shelf with old china or cast iron objects (use that imagination again! )–all these will bring you a warm Hobbitty atmosphere. Before you know it, you’ll be able to settle back and enjoy your little hole-in-the-hill. Have a good cup of tea and read–what else?–There and Back Again: A Hobbit’s Tale by Bilbo Baggins.